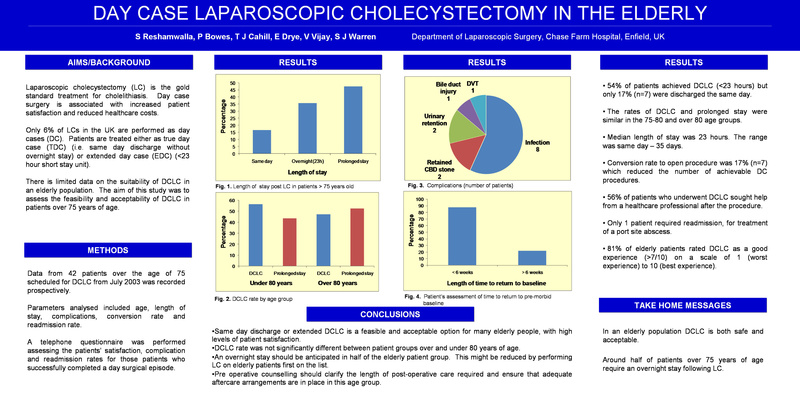 INTRODUCTION: Laparoscopic cholecystectomy (LC) is the gold standard treatment for cholelithiasis, and surgeons are increasingly looking towards day case procedures. However, only 6% of UK LCs are performed as day case (DC) (i.e. same day discharge without overnight stay) or extended day case ( 80 years old. 46% of patients stayed longer than 23 hours. Overall median length of stay was 23 hours (range: same day – 35 days), but the conversion rate to open procedure was 17% (n = 7) with these patients having a mean length of stay of 13.3 days. Information from the telephone questionnaires (from the successful DC or extended DC patients) showed that 56% sought help for post-operative complications, only 1 of which (port site abscess) necessitated readmission. 81% of elderly patients rated DCLC as a good experience (>7/10) on a scale of 1 to 10 (1 = worst experience, 10 = best experience) and 94% would recommend DCLC to a friend or relative. 88% of patients returned to normal activities within 6 weeks, with only 6% of patients requiring analgesia for longer than 2 weeks. CONCLUSIONS: Same day discharge or extended DCLC is a feasible and acceptable option for many elderly people, with high levels of patient satisfaction. An overnight stay would be anticipated in half of the elderly patient group, and perhaps operations early on morning lists therefore recommended. Pre operative counselling should clarify the length of post-operative care required and ensure that adequate aftercare arrangements are in place in this age group.